I just found my new favorite way to eat asparagus – baked asparagus fries! Sooo good. 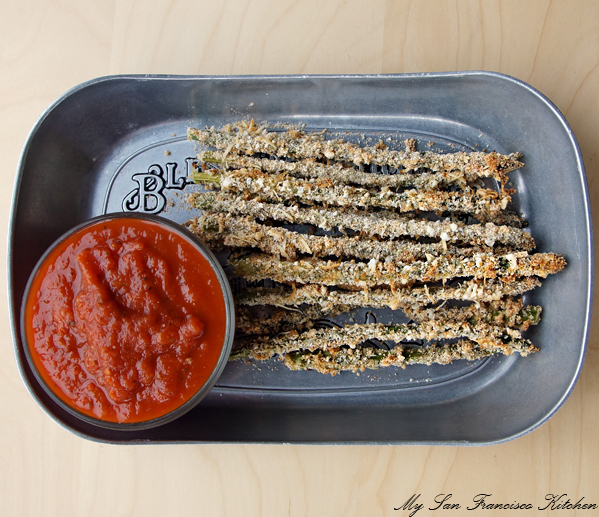 They are perfectly crunchy and go great with marinara sauce. 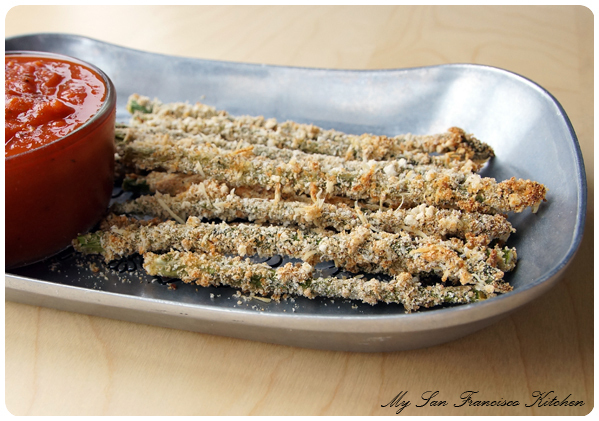 I can imagine many other dips would go great with these asparagus fries as well…ranch? lemon-garlic dip? MMM! 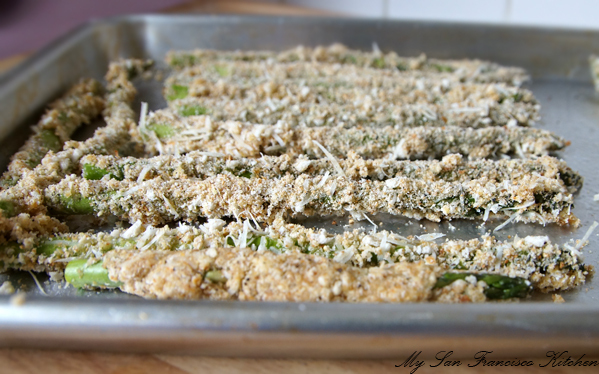 I love making baked zucchini fries, so I figured, why not try it with asparagus? These are so easy to make and are a fun way to eat your veggies! I personally think they taste just as good as fried versions, and they are much healthier & diet-friendly. They go great as a side for lunch or dinner, or you can make them for a fun, healthy appetizer. All you need is a bunch of fresh asparagus, flour, an egg, bread crumbs, Parmesan cheese, salt and pepper. This weekend is the Nike Women’s Marathon in San Francisco, but unfortunately I was too late when I tried to sign up because it filled up SO FAST! There will be about 20,000 runners participating. I was really bummed, because I finally convinced myself I could do it. I have a long history with running – in the beginning, it was a hate-relationship. In P.E. class running was my LEAST favorite activity. In high school, I told myself over and over I just wasn’t born a runner, and it just wasn’t my thing. In college, it became more of a love-hate relationship because I found I really liked getting outside and having “me” time, but my body still seemed to fight it. I couldn’t run more than 1 mile without giving up… Still I kept at it and little by little I found I could run father and farther. Eventually, my body started craving it, and when I didn’t run for a while I felt bad. Now I finally LOVE running because I got a lot better at it by training myself and it is the best “me” time I can get these days (besides baking of course!). It is so good for relieving stress and anxiety, especially when it comes to grad school stress. One of my goals in life is to complete a half-marathon (who knows, maybe a marathon as well!). There is one coming up next February in SF, maybe I will get up the courage again to sign up for that one!! Wash and dry asparagus very well, and chop off the hard ends. 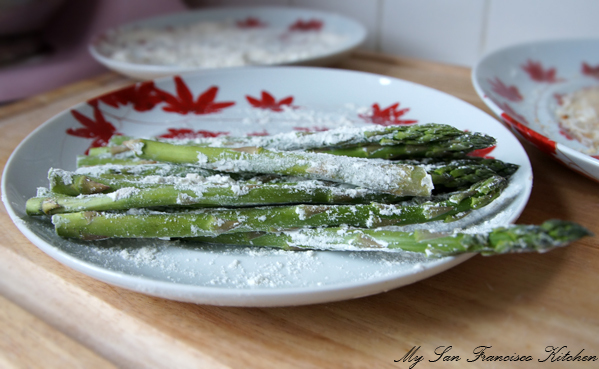 Once fully dried, roll each asparagus stick in the flour (the flour will NOT stick well, but try your best to coat it in the flour using your fingers). 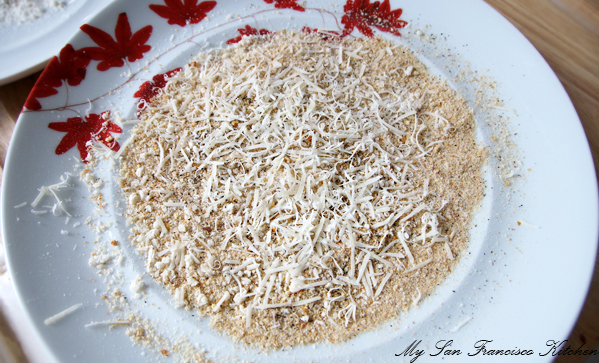 Mix bread crumbs, Parmesan cheese, salt and pepper well on a large plate. Transfer to a lightly greased baking sheet (you can use cooking spray). This entry was posted in Appetizers, Dinner, Lunch, Organic, Sides, Snack and tagged asparagus, baked, bread crumbs, healthy, parmesan cheese. What a great idea! 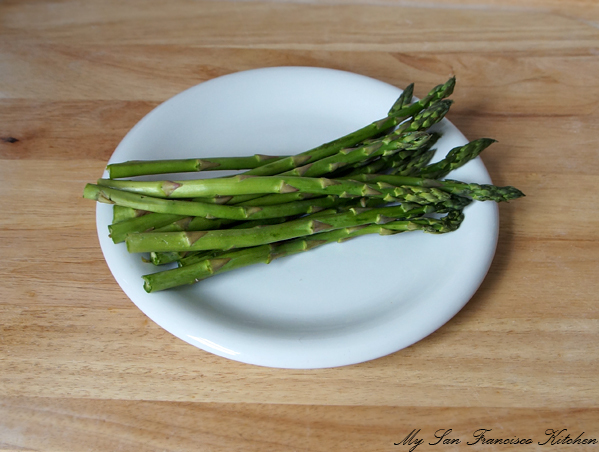 I love asparagus already, but this is a great new way to prepare them. These look so good! I had to share them on EasyRecipe’s Facebook page. 🙂 We are both eager to try this and it’s Spring down under and the asparagus is wonderful right now. These look super delicious! I like your method of breading them. Also, I totally relate to your running story–I used to haaaaaaaate it in middle school during PE, but in high school I started running a mile here or there and then in college it became my main form of exercise to the point of craving it, like you. Those endorphins are just the best! Wow! I love this idea, I can’t believe I hadn’t thought of it! I bet they would be excellent with homemade aioli sauce. I do the same thing to low fat mozarella sticks. Delicious!!! These are absolutely delicious! We eat these (deep fried at Megu, New York) and make it at home similarly too. However, I want to know if there is an alternate to the egg? The people I am going to be serving do not eat eggs. I sometimes just use water. You need it wet to make breadcrumbs adhere. Try it. This will end up being my favorite way to eat asparagus. I love asparagus but it is just so so with my husband, maybe he will like this. Thanks for sharing. Fabulous idea! Can these be made in advance and then frozen until ready to use? Thanks! Hi Lynn! I have never tried that, and am honestly not sure if asparagus can be frozen and then reheated… So sorry! Let me know if you end up trying it out!